Trucks, Utes, SUVs, Vans, and 4wds-Get up to $7000 at your door! Do you live in Sydney and want to sell your old car or any other vehicle? You can get up to $7000 for your junk. Where To Sell Your Unwanted Cars In Sydney For More Cash? Metro Car Removal & Cash For Cars the top buyers of all types of old vehicles and can come to your place to tow it away for free. You can trust cash for cars Sydney for its citywide services. None can beat us at prices for unwanted cars. Cash For Cars Sydney is a top paying car removal service that pays top dollar at the time we remove the vehicle. Our cash for cars Sydney concept is simple. You call on 0422 600 833 obligation quote. If you accept our offer, we will immediately send a team to your place with a towing truck. They will complete the paperwork and will hand you the quoted amount. We don’t charge any towing fees. With us, there’s absolutely no nightmare in having to deal with wrecked cars, accident cars, used cars, broken cars, rusted and damaged cars or any other condition of the vehicle. We readily accept any condition of the vehicle. Why? Because we’re one of the best vehicle dismantlers in Sydney. Even our competitor accept this fact! Get in touch with us on 0422 600 833 for a free cash offer on your unwanted vehicle. You can also get a free quote online. Damaged and wrecked vehicles can sometimes be the toughest to deal with. At Cash for cars Sydney, we come to you and offer cash and remove unwanted vehicle ourselves. Just one call to us is sufficient and we will immediately arrange for a free unwanted car removal within just a few hours on the same day. Before our team leaves, we will put enough cash in your pocket. We’re confident that we will pay you the highest amount in Sydney! There’s no Sydney area we don’t serve! So our operations span Sydney wide and this also includes each and every neighborhood in every town. Just give us a call at 0422 600 833 for car removal. Have a BMW? Have a Ford? Have a Nissan? Have a Mazda? Or Have a Subaru? Whatever type of vehicle you have, whether it’s in running condition or not, we will come over to your place to remove it for free. we accept all available models, of any condition and age, running or not. We offer up to $7000 on all car removals. That’s definitely a lot of cash and for a very good reason. Unlike other auto dismantlers, we have a vast knowledge on vehicles of all models and makes. When you call us, you call an expert wrecker with a huge network of professionals with whom we work closely with. This allows us to pay up TOP DOLLAR on your unwanted vehicle removal in Sydney. Is the old 4×4 or truck totally useless? Maybe just not worth the effort to sell? Then, give Cash for cars a call. It may be totally useless, but it’s of great use for us. When you call us, you will discover it has good value. We offer top dollar on our car removals, even those broken, useless down scrap vehicles. 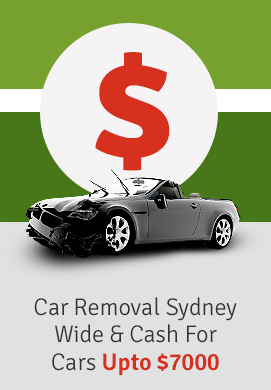 Cash for cars Sydney is the first-rate car removal service and auto dismantler. We buy all types of vehicles and never haggle over price. Whether you have a wrecked van, car, or a scrap truck, we will come and remove it free of charge. We will also pay you top dollar depending upon the condition of your vehicle. We’re sure nobody can beat us on price. At Cash for Cars Sydney wide service, we’re the professionals to call for friendly and fast car removal. As we’re experts we can easily dismantle all type of vehicles including cars, trucks, 4x4s, vans and even motorcycles. We use eco-friendly safe disposal processes. Whether your car is in lousy condition or great shape, Cash for cars Sydney expert dismantlers offer you most of your vehicle, simply because we’re the oldest and the best-unwanted car buyers in Sydney. We offer you the best service and the best possible cash for your junk! Contact us today for instant, free quote.